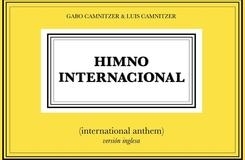 Luis Camnitzer project Himno Internacional (International Anthem) in collaboration with Gabo Camnitzer, as part of Este Arte fair, Punta del Este, Uruguay. Himno Internacional (International Anthem) is a sound artwork composed by a collage of fragments of all the national anthems of the world, in English alphabetical order. The piece will be performed by the marching band of the National Navy on the esplanade of the Legislative Palace on the occasion of the opening of the 3rd Biennial of Montevideo. With the work Himno Internacional (International Anthem), the utopian idea of a composition that unites all inhabitants of the planet is destroyed under a class of less visible chauvinism. Instead of using geography, divisions of nation-states, symbols such as flags and pictures of football teams, this chauvinism happens to be within the diversity of languages that just prevents the unification. For its part, the sound transcends linguistic fragmentation and allow universal access. The model most hymns comes from Western bombastic music of the nineteenth century, which in this case acts as a new Latin sacrifice of local musical contributions of individual countries. “We are honored that father and son have agreed to present this project with us. Through his practice, Luis Camnitzer connects narratives, complexities and documents of the past with our contemporary times. His work contributes to the understanding not only of entangled local histories, but also the importance of looking back as an artist to learn and understand the present. This is in some ways a similar approach to the one we have with the fair, “says Laura Bardier, director of ESTE ARTE. “Furthermore, the ability of Luis Camnitzer to use a wide range of themes and techniques in their research makes it the ideal place to establish this connection between Este Arte and the Biennial of Montevideo. We are very excited to present this special project.” says Craciun Martin, curator of the cultural program.